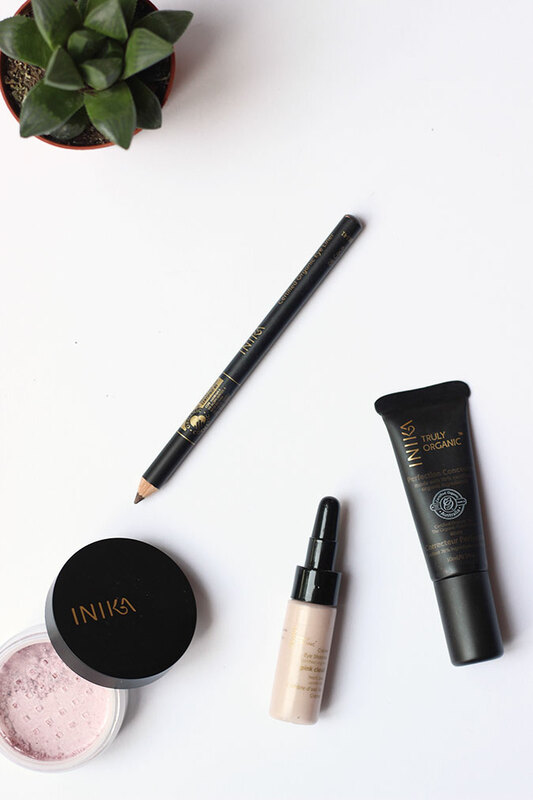 L-R, Inika Certified Organic Perfection Concealer*, Inika Certified Organic Crème Eye Shadow in Pink Cloud*, Inika Certified Mineral Illuminisor*, Inika Certified Organic Eye Liner*. My love for makeup seems to have taken hold around these parts of late as I've been using the same skincare for a while now. I am testing a few new bits so I will be sharing them with you soon, but in the meantime, yay more makeup! 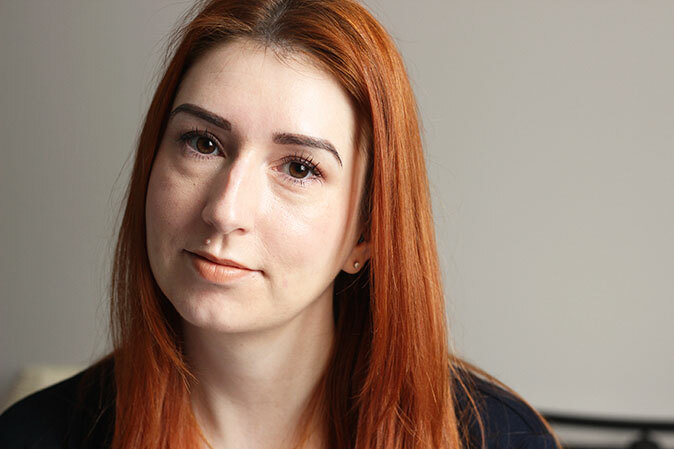 Although I do wear a lot of makeup (my daily bag is rather heavy), I do prefer a natural and generally neutral vibe. So with that in mind here's a look I put together using Inika Organic Cosmetics*. As someone with blemish prone skin I am quite cautious with ingredients, so Inika is completely up my street. All Inika products are between 75-90% organic, 100% natural, cruelty free and vegan friendly so it's without doubt that this Australian brand is one I've wanted to try out for a while. There's no nasties in here at all, actually the list of what's not in their products is probably a lot longer than what's in them! As I was going for a natural look I used the Inika Certified Organic Crème Eye Shadow in Pink Cloud* (£18) all over the lid as a base. It's a light, slightly shimmery cream that blends beautifully and once dry stays put. As it is pretty light I used it as a base to cancel out my veiny lids and to brighten things up a bit. The formula is beautiful and I think I'm going to pick the other two colours in the range. The range only consists of three colours at the moment; a champagne beige and a cool slate grey but they are really beautiful shades that would suit everyone. The formula is really buildable so you can apply shadow over the top or wear them on their own. You also need the tiniest little amount so it will basically last forever. To add a bit of colour I smudged the Inika Certified Organic Eye Liner in 06 Coco* (£13.50) close to the lash line on my eyelid. This is my favourite way to wear eyeliner, it makes my lashes look nice and thick and this chocolatey brown shade really compliments my eyes. The pencil is super buttery and pigmented and doesn't drag at all. It also has a sharpener on the end which is bloody handy as I can never find one when I need it! Base-wise I used the new Lancôme Cushion Foundation (more on that to come soon), and the Inika Certified Organic Perfection Concealer* (£21) to cover some acne scars and to add a bit of light under my eyes. This is the lightest shade of the two which is a little bit yellow toned for me but it blends in really well so it doesn't matter that it's not the perfect colour match. 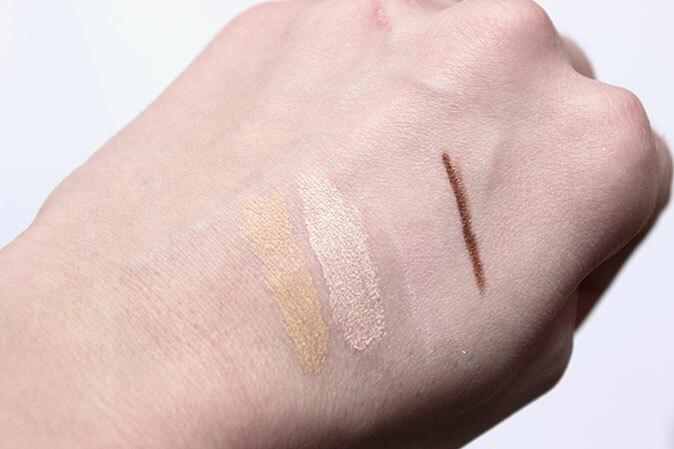 It's a light-reflecting mineral concealer which I really like for concealing blemishes as it's quite hydrating and doesn't cake but it doesn't do much for my eye bags unfortunately. To finish things off I dusted the Inika Mineral Illuminisor* (£17) all over my face. This is a loose powder that you can either use as a highlighter, blush or all over powder. It's a dreamy very light pink shade that will suit all skin tones. It's super finely milled and slightly shimmer without being glittery so I love using it all over my face as it perks up my skin nicely and doesn't feel heavy. So that's my face, with makeup on it! What do you think of this look and have you tried Inika before? The post A natural makeup look with Inika appeared first on Lelore. Your photography is spot on, so envious! That aside, love the look you've created, you look gorgeous. Defiantly lusting after the highlighter now!